Bal Thackeray : The Two-Way After the death of Hindu extremist leader Bal Thackeray, authorities feared there might be violence. So, much of Mumbai was shut down during Sunday's funeral. There were no problems. But one young woman's comment on Facebook questioning the need to shut down the city led to her arrest. 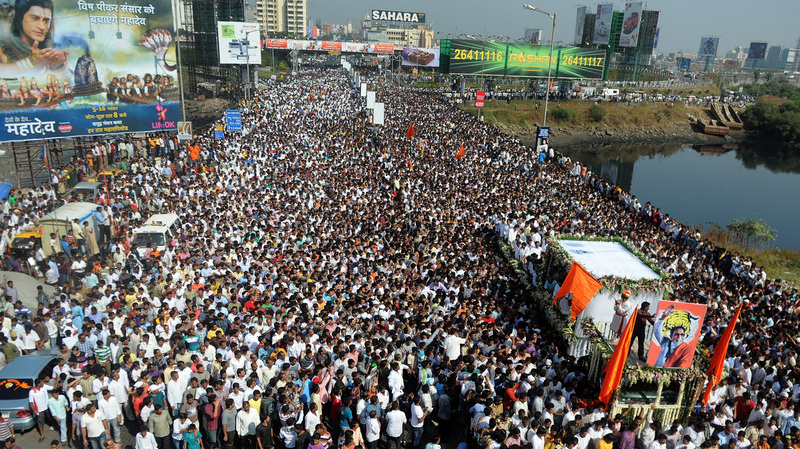 Bal Thackeray's funeral cortege made its way through a sea of supporters in Mumbai on Sunday. There was no violence, as had been feared, when hundreds of thousands of people gathered Sunday in Mumbai, India, to express their grief over the death of Bal Thackeray, "a Hindu extremist leader linked to waves of mob violence against Muslims and migrant workers in India." But there is outrage in India, according to the Hindustan Times, over the arrest of a young woman who wrote on Facebook over the weekend that people such as Thackeray die every day and Mumbai should not have been shut down because of his death. A friend of hers who "liked" the post was also arrested, says The Times of India. While the two have been released on bail, they're accused of "promoting enmity, hatred or ill-will between classes," says IBN Live. It adds that no one has yet been arrested for the damage done to a medical clinic run by the girl's uncle. It was attacked by a mob that was angered by her Facebook post. The Press Council of India is demanding that authorities take action against the police officials who arrested the women, the Hindustan Times reports. "[Was] an 86-year-old powerful, rabble-rousing orator for Shiv Sena — which means Shiva's Army. ... Thackeray's Sena is among the most xenophobic of India's Hindu right-wing political parties and held power in Mumbai from 1995 to 2000. His supporters often called him Hindu Hriday Samrat or emperor of Hindu hearts. "In 1992, members of Hindu right-wing groups, including the Sena and the Bharatiya Janata Party, were instrumental in destroying a 16th century mosque in north India that they said was the birthplace of the Hindu god Rama, and Thackeray was blamed for the violence and rioting that followed. In Mumbai alone, nearly 1,000 people were killed." The AP says that Sunday in Mumbai, "nearly 20,000 policemen were on hand because of the violent history of the group. The mourners, however, remained calm and orderly as the body of Thackeray was cremated at Shivaji park where he had made political debut by addressing his first public rally 46 years ago."